Something yanked hard on his tail, and he grunted, trying hard to hold onto sleep. In vain. "Wake up! If my father finds you here he'll kill you! And then he'll kill me!!" Dahga opened one eye, sleepily. The little nymph he'd spent the night with was wide-eyed with something approaching panic: he grinned and pulled her lithe, slender form back into his arms. She squeaked - then melted into his strength, squirming against the heat of his muscular body, sighing. "You're... wicked, you know that?" He chuckled, the sound deep and rich. 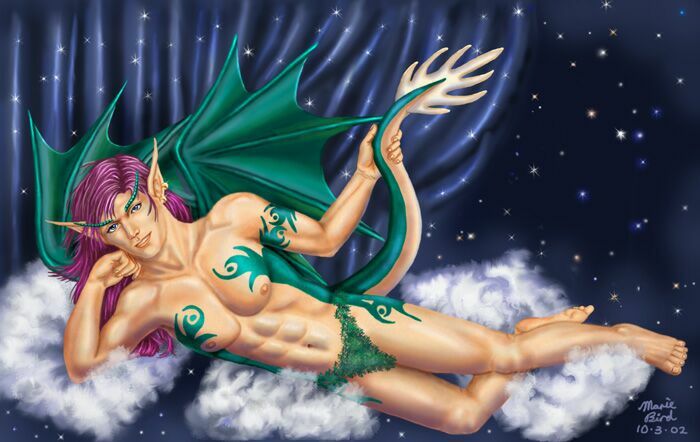 "And don't you just love it..."
She giggled, then kissed along the elegant curlicues of rich green adorning the skin of his chest and sides, one hand stroking the underside of his tail. He shivered and rolled onto his back, tucking his wings tightly under him. Iiffa giggled again, fingers tweaking the large... solid... staff... at his groin. He grinned at her, stretching, and settling his hands behind his head, then smirked. "Oh dear. Someone really should do something about that, you know..."
She knelt upright, gazing down into brilliant blue eyes, her own a smoky gold, the autumn colour of the leaves of her tree. In her soft warm nest in which they were currently entwined. She smirked down at him. Afterwards they half-dozed together, the sun warm on their skin, Iffa's hand resting lightly against her bedmate's chest. Dahga nuzzled her vivid green hair, wondering if they had time for another... Then his large, sensitive ears twitched, catching the rumbling tread of Iiffa's father - the Green Man, the forest king - approaching. Dahga pushed himself upright, leisurely, and pulled the sleepy - and, he accepted with a resigned sigh, probably pregnant - nymph into his arms. "I have to go, little one. But I'll come back as soon as I can." She pouted, wrapping slender arms around his broad shoulders. He nodded regretfully, kissing her forehead. She squealed and tumbled from his embrace, pushing at him with delicate small hands. Glancing back over her shoulder, Iiffa shoved at him, ineffectually, her fear evident in her posture. He gazed at her for a moment, bright eyes soulful, then grabbed her into a warm embrace. She hugged him, then pushed at his chest. ...to rise seconds later, catching thermals as he spiralled into the sky, bright amethyst mane tumbling about his shoulders, arms stretched gracefully back, close to his body, hands twitching a delicate counterpoint to the strong tail that adjusted his course through the upper air. Dahga was a superlative sky-master. The afternoon was well advanced by the time he reached the lush vale in the mountains that they called home. As he'd expected, Vicaa was waiting for him, slender form and moon-pale skin bright against the rich dark green of the moss that carpeted the lookout rock. Also as he'd expected, his long-time friend was scowling at him, fine silver brows drawn together above huge spring-leaf-green eyes. "I know. I'm sorry. I got you these to apologise..." As he landed Dahga tossed his friend a handful of the sweet berries he knew were a favourite. Vicaa caught them, but laid them down carefully on the rock, determined not to be distracted. He crossed his arms over his chest and glowered, nostrils flared. "Do we have to do this every time I come back?" "And will you be going back to her?" "'Course not! Daddy would kill me!" "You really shouldn't be so irresponsible." Vicaa paced, long silver tail twitching irritably behind him, the delicate spiral horn adorning his brow lowered as he glared at his old friend. Dahga sighed and shrugged his wings. "Hey, I don't ask for this, you know. They just find me irresistible." "Sure it is! Just because you've never..."
Vicaa rounded on him, fury sparking in his eyes as his mane swirled around him. "Don't you dare bring that up again!" Dahga lowered his head, spreading his wings wide. Vicaa stared at him for a moment, then sighed. If only you could... the dragon thought, dryly. But Vicaa had resumed pacing. "How many spindrift have you sired now?" "I've lost count." He frowned. "Uh, why are you interrogating me? More than usual, I mean." The unicorn paused, his back to Dahga. The dragon watched him for a moment, admiring the long mane that ran in a line all the way down his back to meet the base of his tail in a cluster of small curls. Way back when they'd first met, and Vicaa still accompanied him on his nightly jaunts, running fleet-footed and tirelessly while Dahga soared above, there'd been many a wench who'd wanted to get her hands on that wealth of shining silver hair - and the body it adorned. (There still were, come to that...) And Vicaa had ignored them all, remaining aloof and distant and puzzling the hell out of Dahga, who couldn't understand why he didn't just take what was offered so freely. Was the unicorn shy? Frightened of females? Jealous? Or simply dense? He'd asked, in his usual forthright manner. Vicaa had given him a look of horrified disgust, muttered something about 'unicorn nature', and refused to talk about it. So the dragon had tried asking other people, but to little avail. No-one seemed to know much about the nature of unicorns - but then again, they were very rare. Perhaps Vicaa just wanted someone of his own kind to mate with. Whatever the reason, they'd been companions for ten years now, and as far as Dahga knew the fey creature was still a virgin. Something he seemed to find both embarrassing and infuriating. Vicaa turned back to his friend, shaking his head. "Sorry. None of my business. Hungry?" They ate by the lake - roasted deer for Dahga, an assortment of honeyed fruit for the unicorn - in a comfortable silence, sprawled at ease as the sun set and the first of the moons rose. Dahga was almost asleep when Vicaa sighed and turned to him. "Do you ever wonder why we're here?" The unicorn lowered his eyes. "Why are we here? What is our purpose in life?" "To have a good time!" Vicaa snorted, tail swishing loudly against his thigh. "So'm I. And if you'd just let loose a little and try enjoying yourself, you'd see what I mean." Vicaa shoulders slumped as he shook his head. "There's more to life than that. There must be..."
Dahga frowned at the bowed, moon-silvered head and sighed. He'd been beginning to believe that the unicorn had got over the strange self-questioning urges that occasionally afflicted him, but obviously he'd been mistaken. Then he brightened. "There's a fayre over at Trollham starting tomorrow. Let's go." "Why? Well, because it'll distract you. There'll be food and drink, and dancing, and tumblers, and maybe an elf or two. And we'll probably meet a few friends..."
"I don't have any friends." Vicaa interrupted petulantly. Dahga scowled. Dahga continued with forced enthusiasm. "... And you never know, there might even be another unicorn there..."
Vicaa tilted his head, regarding the dragon from the corner of one large eye. "You mean well. But I don't think there are any others left." "How can you know? It's been years since you went looking - and you were never very eager even then!" In fact, despite his friend's protestations, Dahga had long ago come to the conclusion that Vicaa didn't actually want to find another unicorn, though quite why he'd never been able to fathom. "And even if we found one, it would probably be another male." the unicorn continued, ignoring the dragon. "But even so, you'd have another of your kind to talk to, share things with. Surely that would be better than nothing?" Vicaa turned to him, eyes wide and tragic in the moonlight. Dahga stared for a minute or two, then snorted loudly, gave up, rolled over and fell swiftly asleep. He awoke to Vicaa's cool slender hand shaking his shoulder, the low voice hissing urgently in his ear. "Wake up! There's someone coming - and they don't smell happy..."
He rose hurriedly to his feet, stretching his wings and turning hastily to the unicorn. "If she asks, you haven't seen me in years. I'll meet you in Trollham this afternoon..."
He took off swiftly, Vicaa's plaintive - "Does this mean we'll have to move again?" - floating faintly after him as he headed for the clouds. Once on the other side of the mountain he paused for a moment, riding an updraft as he frowned to himself. Lahmia was beautiful, and passionate. She'd entranced Dahga for several moons, drugging his senses and firing his blood - not difficult at the worst of times but with Lahmia... She and the dragon had had a lot in common. And finally they'd ended up with even more in common - a clutch of cute but deadly little half-dragon, half-serpent infants. He'd not told Vicaa what had happened - it would only have resulted in yet another lecture about responsibility and doing the right thing. He'd heard it all before and didn't need to hear it again. Now, however, he felt a twinge of guilt. It was cowardly leaving Vicaa to deal with the angry female - not that Vicaa would come to any harm: Dahga had seen the unicorn in action in a number of tight situations and despite his apparent physical fragility and effete appearance he could fight with the best - or worst, given the damage he was quite happy to inflict with that horn - of them. Dahga sighed. Vicaa. His good friend. He really didn't appreciate the unicorn enough. Well, perhaps he could find a gift for him at the fayre, something pretty to say 'thanks'. There were bound to be some dwarvish gem-smiths there, and Vicaa loved jewellery. Nodding to himself, Dahga wheeled in mid-air and headed for the village, wingbeats leisurely against the vibrant sky. Trollham was bustling, the streets filled with creatures hawking wares, or services, or looking over what was available, or eating or drinking or simply observing. A scuffle - good-natured right now though that could easily change - was taking place between a couple of shape-shifting fox-folk, a native troll, and a somewhat surly manticore. Dahga was tempted to join in for a moment, then recalled that he was in enough trouble with Vicaa as it was: best not to make things worse. Dahga sighed and shook his head, and strode forward to join his friend. Vicaa glanced at him from the corner of an eye and snorted quietly. "The next time you land me with such a... such a... harpy I'm leaving you." "She's a snake, not a harpy." Vicaa turned to him, tossing his mane and planting his fists on his hips as his tail flicked vigorously from side to side - to the delight of a couple of young sirens who took the opportunity to ogle the tight backside the action revealed. "She coiled by my lake in my meadow and made me listen to her invective for an hour!!" Vicaa lowered his head, gazing up through long silver lashes as his horn hovered threateningly at Dahga's throat. "I should have told her where to find you." The dragon touched the point of the unicorn's horn, pressing a fingertip against the sharpness and pushing the weapon gently away from his neck, ignoring the blood that ran down his hand and dripped, steaming, onto the ground. "I'm sorry. I really am. I'll try not to let her find me again." Vicaa closed his eyes and clenched his fists in frustration. "That is not the point!" he hissed through gritted teeth. "If you'd only learn some self-control you wouldn't find yourself in this position in the first place!" Dahga spread his hands wide, grinning suddenly. "I know. But what's a hot-blooded young dragon to do, eh?" Vicaa gave him a frosty glare. "All dragons are hot-blooded. Most of them have more restraint." Dahga laughed self-deprecatingly, shaking his head. "I'll try, alright? Now, I want to take a look at the metal-workers' wares. Will you come with me?" Pouting, trying unsuccessfully to hide his willingness, Vicaa followed his friend to the far side of the village square. A while later they sat side by side on the wall of the village well, Vicaa - and the small crowd nearby - admiring the finely-wrought silver and moonstone bangles on his wrist. They'd cost Dahga the next two day's worth of labour at the forge, but it was worth it to see the smile back on the unicorn's face, to know he was forgiven. Until the next time, anyway. He grinned. "They're beautiful. They suit you." The unicorn inclined his head, silver mane spilling over one shoulder. "Yes, I do believe I... am..."
Dahga glanced up sharply as Vicaa's voice trailed off. The wide green eyes were huge, fixed intently, the mobile lips slightly parted. The dragon frowned and swung his head in the direction the unicorn was staring.